“It’s a great day for Fayette!” was a phrase repeated several times in the announcement of the formation of Fayette Fabrication. 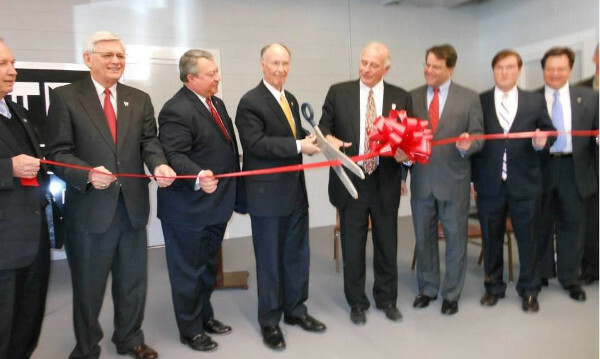 Governor Bentley and Fayette area leaders celebrated today the opening of an Alabama-owned start-up company that will manufacture and refurbish the “racking systems” used to transport finished parts from the automotive supplier firms to the auto manufacturers, such as Mercedes. Following intense research into this market, Fayette Fabrication investors recognized the growing demand for these products, and the fact that customers are underserved, since most precision steel rack manufacturers are still located in northern states serving the original automotive hub in the Midwest U.S. In addition to the parts racks required by suppliers (auto parts manufacturers), the auto manufacturing plants themselves use a variety of racks and carts to move and deliver parts on the production floor where they will be used/assembled. As a result, Fayette Fabrication plans to provide these custom-built units to fill another of the “missing pieces” of the growing automotive industrial sector in the Southeast U.S. The company will invest approximately $1.5 million in equipment and inventory and expects to create 50 well-paying jobs within the next 2-3 years. Fayette Fab will occupy approximately 50,000 square feet of a 135,000 square foot former manufacturing facility on US 171 South in Fayette, which is only a 45 minute drive north of Tuscaloosa. Many of the initial targeted customers are located in the Tuscaloosa market. The close proximity to the Tuscaloosa market will greatly reduce shipping costs and time involved in service and delivery. The remaining space within the building will be developed as an Incubator to accommodate and grow other start-up firms. This project is now in the final planning phase, with an announcement expected by the end of the first quarter of this year.